All about new beginnings. A fresh start towards your heart’s desire for the cosmic attire of The Fool. This is the 4th installment of an ongoing, weekly series we’re trying out here on the 1HP site called Oliver’s AfterThoughts. Each Friday morning I post a card from the Afterthoughts tarot deck by Corrine Kenner. These tarot pulls consist of a single card garnered by means of my attracting one infused with the energy of the Oliver collective, intended as its prediction of what to expect for the weekend / week ahead. Card of New Beginnings, the happy wanderer, aka The Fool (in reverse) is here to remind you to stop and smell the roses as you wipe the slate clean and emerge again, upright in the knowing you are square with yourself on matters of personal spirituality and expanded consciousness. 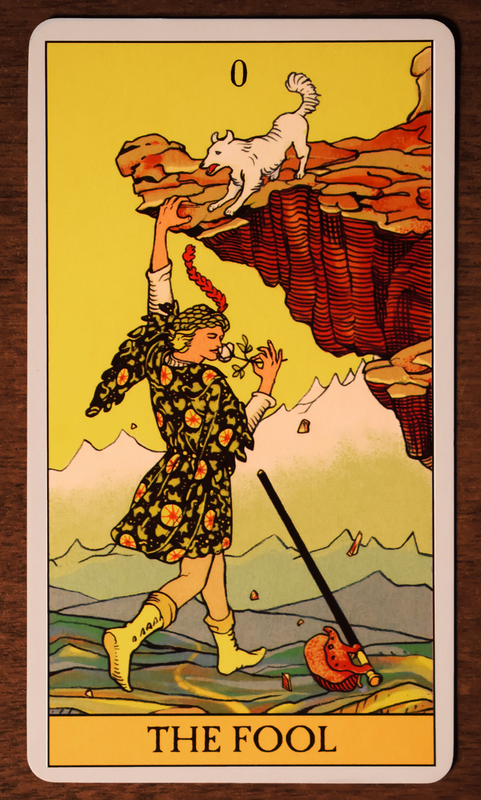 The Fool is the only unnumbered card in tarot. Zero represents the period before existence or the state of non-being. 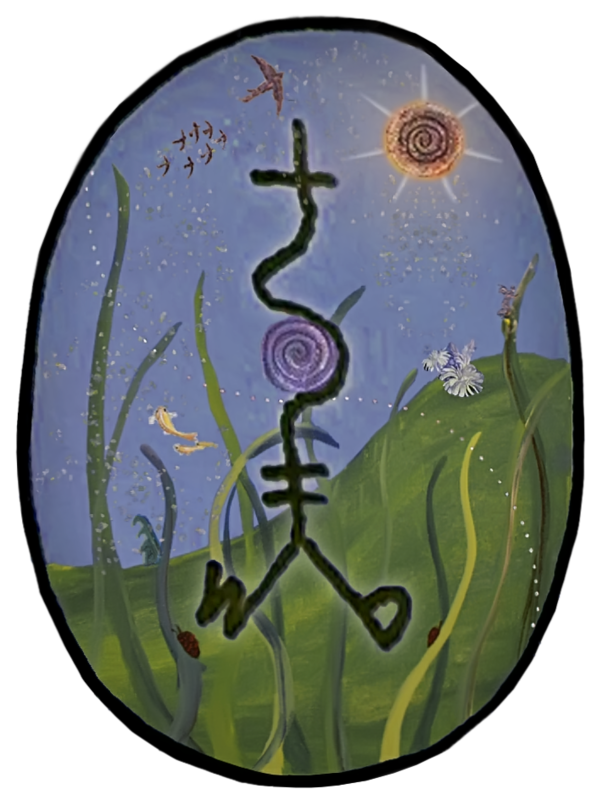 Zero also represents the cosmic egg*, the wheel of the year, and the cycle of life. Like a ring, the zero has no beginning and no end. This character can wander outside the bounds of society’s rules and regulations. He has the freedom to enjoy life’s journey without worrying about deadlines, timelines or final destinations. The fool is a simpleton, joker, clown and trickster. He’s also wiser than he seems. He uses his innocence and simplicity to question the established standards of society, culture, and civilization. 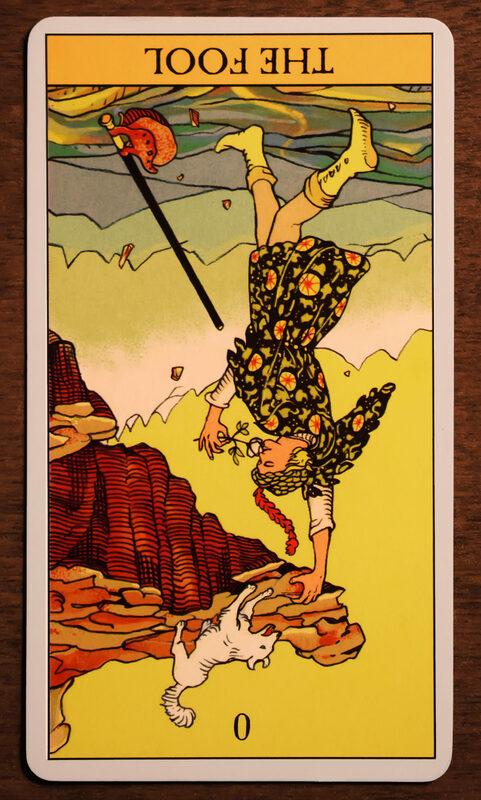 The fool hangs from the edge of a cliff. The cliff is crumbling… The fool seems completely undisturbed. At the moment, the fool’s sole focus is the white rose in his hand. He inhales its scent, breathing deeply, with his eyes closed. He embodies the element of air. He’s light, and he’s not enslaved to gravity. Like a feather on the wind, he’s calm and unconcerned about the mendacities of day to day life. The white rose is a symbol of innocence and purity. The dog is the Fool’s conscience and voice of reason. The cliff is a chasm, a divide that separates one world from another. The walking stick provides grounding and stability. At the moment, it offers neither. The backpack holds all of the Fool’s worldly belongings but in a symbolic sense, the backpack also holds his karmic baggage. The world as you know it is blissfully slipping away. At some point you have to let go completely. In this scenario, the fool is falling up instead of down, and is thus headed into the ethereal, the unknown. He is going happily and ready to release all burdens, karmic or otherwise. His new beginning awaits. He is you. Let go, fool, and allow yourself to fall into the akashic of all you desire. You will land on your feet. *cosmic egg: this reference reminds one of the 1HP logo, an egg shaped icon symbolizing the actuality that the pathway… YOUR pathway is open. 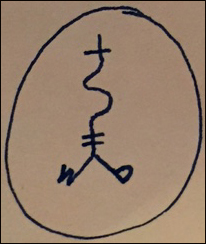 Behind the scenes here at 1HP, this sigil has become a symbol of cracking through the egg shell of convention and reality into the core of consciousness and self-awareness. Fitting for this week’s OAT theme.